Roland Boss are known for their quality of guitar effects and floor pedals. So they launched the GT-001. But is this any good? Roland Boss GT-001 Guitar Effects and Amp Simulator Unit Review. Does this even compare to the GT-100? 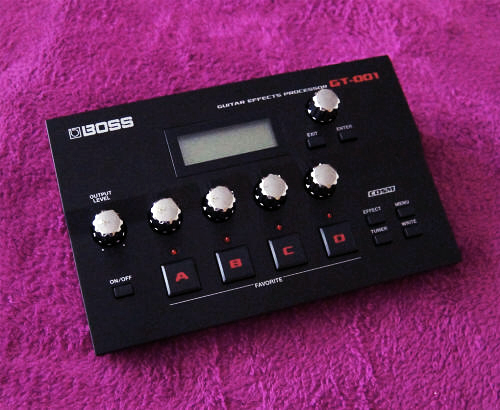 Roland Boss are well known in the effects processor and general music product industry and one of their recent units aimed at guitarists or the budding recording guy is the GT-001. Roland say that the GT-001 has many of the sounds that are in the Version two of the GT-100 - a floor effects unit that leads the pack somewhat, so I decided to review this GT-001 to find out exactly how good it is in reality. The GT-001 is designed for the desktop and that's the first move away from where Roland have mainly been over the years, but the specs looked quite useful. One of the features, the streaming of sound in to a DAW is a welcome one as there are nay interfaces, but they don't have all the features or additions that this little unit has as standard. It's a small unit and at first when you look at it, you might think that Roland just sold you a matchbox... well it's not quite that small but lets just say that if you judge it by its looks you might wonder why it was so expensive (for what it is) in the first place. But getting to the core of the GT-001 what matters is how does it sound? are the effects actually any good? and what about those simulations of amplifiers that Roland harp on about? Do they sound like a bee in a tin can? This in depth review is one of my inside and out reviews so you get to see far more than just someone playing around on the unit - you actually get to see exactly what you are buying regarding the quality of the product too and that matters. This review is being written presently check the news page for updates.